STYCCO FLEX is suitable for fixing stair nosings without the need for mechanical fixing to suitably sound substrates. It is also suitable for securing carpet gripper, PVC cladding, skirting boards, architrave and trims. STYCCO FLEX has outstanding plasticiser resistance, high bond strength and excellent dimensional stability for securing highly plasticised PVC flooring accessories and trims including skirting, coving, capping and edging strips. It can also be used to secure header rows when installing wood flooring. 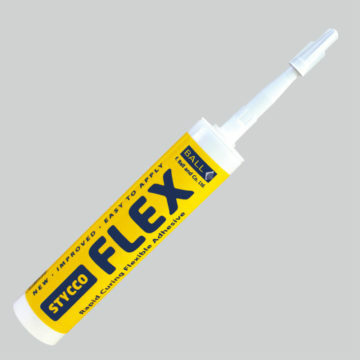 STYCCO FLEX is a rapid curing flexible adhesive with excellent gap filling properties that is suitable for bonding a wide range of construction and building materials to most surfaces in both internal and external environments.